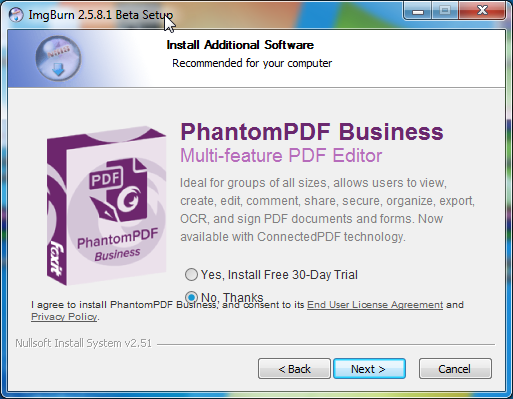 Your program is great but it should not be installed with malware! 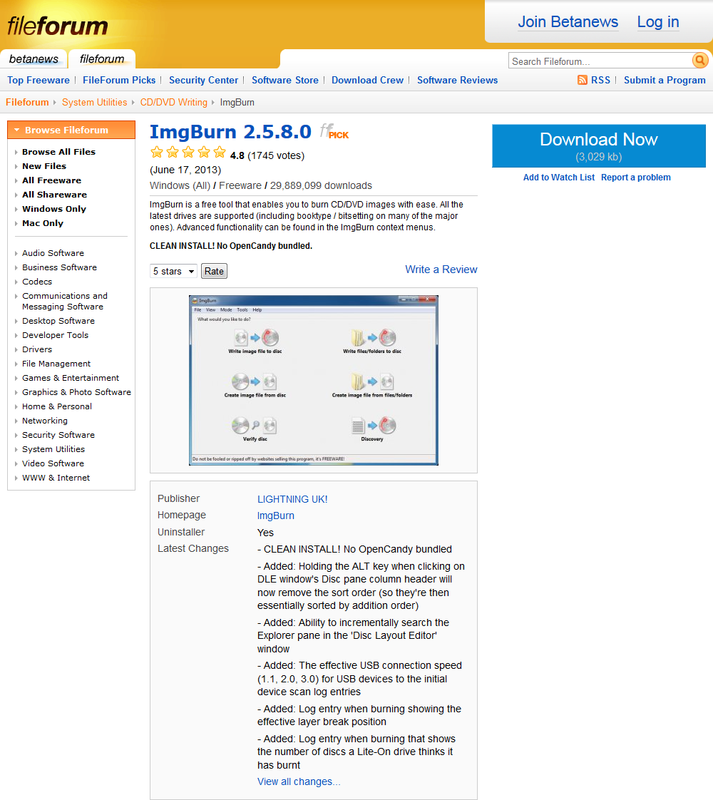 ImgBurn works great and you should be proud of it... but to allow people to install malware with it unless they are super-vigilant during the installation process is just plain wrong. If your justification for this is that you need to earn money, that is not ok. You should find other means which do no involve infecting people's computers with Malware. I don't know what you're seeing, but I just got this when I ran through the installer. For that offer, I wouldn't say I needed to be 'super-vigilant' during the installation process. I would also just call that 3rd party software rather than malware. I do realise that different people get different offers each time though - although none of them should be actual malware! I never know what you'll see or have any control over it. This installed about 5 or 6 unwanted, potentially MalWare, programs which I then had to spend some time tracking down and removing. Then you downloaded the wrong thing from that mirror site - probably by clicking on an advert rather than the actual download. The real download button/link on that site is labelled as 'Click Here To Download' and is in the upper right green box (out of the 4 green boxes). The facebook widget is just below it. ImgBurn the program that just keeps giving! I spent a few hours yesterday un-infecting my computer from some of the other Malware that was installed along with your program a few weeks back. This one kept popping up new ad windows in the Chrome and Edge browsers whenever I tried to browse normally safe sites on the internet :-( I couldn't get rid of them except by installing the Malwarebytes program which was recommended by Google on a forum about getting rid of these malwares from Chrome. It detected 35 threats, 3 of which were rated as a risk level of "high". Anyway my system is clean now, but I am certainly not happy about your software being packaged in such a way that even an expert PC user and fellow developer like myself was tricked into installing this adware. I would strongly ask you to re-consider your distribution channel! Where did you download it from in the first place?